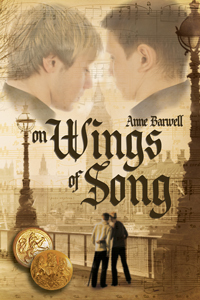 Literature plays an important part in On Wings of Song. When Jochen and Aiden—two soldiers fighting on opposite sides—meet during the 1914 Christmas Truce, they find a common interest in literature. Their discussion of Dickens and Tennyson leads to a mutual understanding, recognition of a kindred spirit, and a brief friendship each man wishes they had the opportunity to pursue further. The choice of Dickens came from studying David Copperfield as part of a university paper on Victorian Literature. Like Aiden, I must admit to it being the only Dickens I’ve read so far, although he does something about that, and I haven’t… as yet. The other reason for those choices is that I needed something that was published before 1914. I twitch when I read books or watch TV or movies set during an earlier time period, and characters are discussing literature and music that hasn’t been written yet! The same held true for choosing a movie Aiden and Jochen could go to see together in 1920. I’ve been watching a lot of classic movies over the past couple of years thanks to our group’s monthly classic movie nights, and grown a new appreciation for them. Films in 1920 were silent as the talkies were still a year or two away. Choosing a film for Aiden and Jochen to watch was easy once I found a list of what was showing in Britain at the time and found something they’d both love. Having them discuss English literature on a battlefield might seem surreal but it reflected the feel of the truce itself. Men on opposite sides laid down their arms, and enjoyed a brief peace, celebrating Christmas together in a moment of sanity amongst the horrors of war. Thanks again for hosting me, Grace.